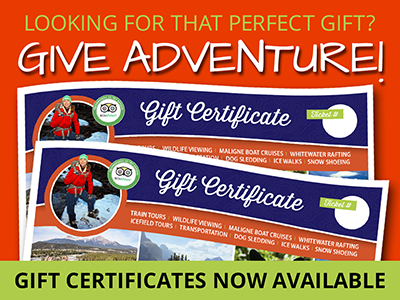 Allow Sundog to assist you with Banff Alberta Canada activities and transportation planning. Banff Alberta, combines wild alpine beauty with first-class amenities and activities. Planning a vacation to Banff, offers boundless possibilities. As diverse as the Canadian Rocky Mountain landscapes themselves. Few places in the world have such stunning scenery as Banff Alberta. Fewer still offer the warm hospitality and excellent service and activities you can enjoy in Canada’s first national park. Spanning 6,641 square kilometres (2,564 square miles) of valleys, mountains, glaciers, forests, meadows and rivers, Banff National Park is one of the world’s premier activity destination spots. In addition to the hot springs, Banff Alberta is home to a number of outstanding geological and ecological features. The Castleguard Caves in the remote northwest corner of the park are Canada’s longest cave system. The park also contains Alberta’s southernmost herd of the endangered woodland caribou. Banff has a long tradition of hosting international guests. From five-star elegance to the cozy comfort of private chalets, there are numerous hotels, motels, condominiums resorts, lodges, bed & breakfasts and private home accommodations that will make you feel at home whatever your tastes. Sundog vacation experts can assist you in organizing transfers from Calgary and suggest and book a number of interesting tours while in the area for your convenience. Spend a few nights in Banff, then take our Sundog Sightseeing Tour along the Icefields Parkway into adjoining Jasper National Park. 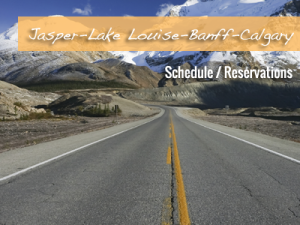 If you require a transfers to the Rockies in the winter let us take the stress out of winter driving with our Connector Service between Calgary, Banff, Lake Louise and Jasper. Let us be your guide, we live here!